This is the description of the LabVIEW API bindings for the Segment Display 4x7 Bricklet. General information and technical specifications for the Segment Display 4x7 Bricklet are summarized in its hardware description. An installation guide for the LabVIEW API bindings is part of their general description. The example code below is Public Domain (CC0 1.0). Generally, every method of the LabVIEW bindings that outputs a value can report a Tinkerforge.TimeoutException. This error gets reported if the device did not respond. If a cable based connection is used, it is unlikely that this exception gets thrown (assuming nobody plugs the device out). However, if a wireless connection is used, timeouts will occur if the distance to the device gets too big. The namespace for all Brick/Bricklet bindings and the IPConnection is Tinkerforge.*. Creates an object with the unique device ID uid. This object can then be used after the IP Connection is connected (see examples above). For example to set a "5" you would want to activate segments 0, 2, 3, 5 and 6. This is represented by the number 0b01101101 = 0x6d = 109. The brightness can be set between 0 (dark) and 7 (bright). The colon parameter turns the colon of the display on or off. Returns the segment, brightness and color data as set by SetSegments(). Starts a counter with the from value that counts to the to value with the each step incremented by increment. The length of the increment is given in ms. Example: If you set from to 0, to to 100, increment to 1 and length to 1000, a counter that goes from 0 to 100 with one second pause between each increment will be started. The maximum values for from, to and increment is 9999, the minimum value is -999. Using a negative increment allows to count backwards. You can stop the counter at every time by calling SetSegments(). Returns the counter value that is currently shown on the display. If there is no counter running a 0 will be returned. Returns the version of the API definition (major, minor, revision) implemented by this API bindings. This is neither the release version of this API bindings nor does it tell you anything about the represented Brick or Bricklet. Returns the response expected flag for the function specified by the function ID parameter. It is true if the function is expected to send a response, false otherwise. For getter functions this is enabled by default and cannot be disabled, because those functions will always send a response. For callback configuration functions it is enabled by default too, but can be disabled by SetResponseExpected(). For setter functions it is disabled by default and can be enabled. Enabling the response expected flag for a setter function allows to detect timeouts and other error conditions calls of this setter as well. The device will then send a response for this purpose. If this flag is disabled for a setter function then no response is send and errors are silently ignored, because they cannot be detected. See SetResponseExpected() for the list of function ID constants available for this function. Changes the response expected flag of the function specified by the function ID parameter. This flag can only be changed for setter (default value: false) and callback configuration functions (default value: true). For getter functions it is always enabled. Changes the response expected flag for all setter and callback configuration functions of this device at once. Returns the UID, the UID where the Bricklet is connected to, the position, the hardware and firmware version as well as the device identifier. The position can be 'a', 'b', 'c' or 'd'. The device identifier numbers can be found here. There is also a constant for the device identifier of this Bricklet. Callbacks can be registered to receive time critical or recurring data from the device. The registration is done by assigning a function to a callback property of the device object. The available callback property and their type of parameters are described below. Using callbacks for recurring events is always preferred compared to using getters. It will use less USB bandwidth and the latency will be a lot better, since there is no round trip time. This callback is triggered when the counter (see StartCounter()) is finished. This constant is used to identify a Segment Display 4x7 Bricklet. The GetIdentity() function and the EnumerateCallback callback of the IP Connection have a deviceIdentifier parameter to specify the Brick's or Bricklet's type. 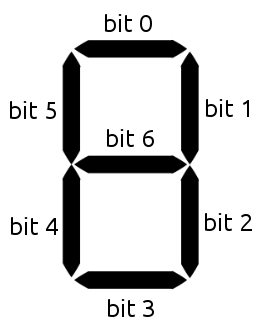 This constant represents the human readable name of a Segment Display 4x7 Bricklet.